This is a natural, genetically programmed process that is the result of slow tissue degeneration, determined by a person's genetic makeup. This "biological clock" does not tick at the same rhythm for everyone. Caused by several environmental factors, such as sun exposure, pollution, stress, smoking, etc. The sun and its UV rays: photo-aging is the premature aging of the skin caused by repeated exposure to ultraviolet rays from the sun or from artificial sources, causing permanent effects that are both superficial and profound. The environment: pollutants in the atmosphere weaken the skin's protective hydrolipidic film, and generate free radicals with high oxidizing power, contributing to an accelerated aging of the skin. The harmful effects of pollutants are evident in the short term, but also in the long term, with the cumulative effects of low-intensity, but repeated aggression from pollutants. Lifestyle: smoking, stress, excess alcohol, unbalanced diet, etc. An unhealthy lifestyle can cause the skin to lose its vitality and glow. The signs of age change as life goes on. The first signs of skin aging- wrinkles and fine lines, a lack of radiance in the skin tone and a loss of elasticity - begin to appear. These signs are linked to a slowdown in skin cell metabolism and to repeated attacks from free radicals: oxidizing agents, among others, triggered by exposure to UV rays. Next, wrinkles form deep furrows and the skin loses firmness. 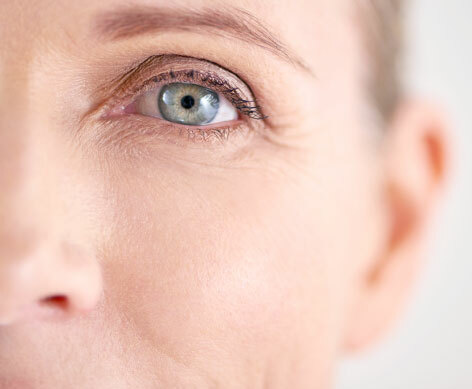 These signs of aging are essentially linked to the disappearance of collagen fibers and a lack of hyaluronic acid, the fundamental substance of the dermis. Finally, mature skin loses its density, vitality and comfort. - Hyaluronic acid and collagen, key skin-support molecules, are also reduced. The skin's structure becomes more fragile, loses density and begins to sag. - The skin also becomes dry, and the natural synthesis of skin lipids is decreased. We might not be able to slow down time or prevent the stressful events of life, but we can nonetheless act on photo-induced aging, triggered by the skin's exposure to ultraviolet rays, which cause almost 90% of skin aging. In reality, excess sun exposure should be avoided from birth. But it's never too late to start doing the right thing. Preventing photo-aging means using sun protection, i.e. being constantly prudent concerning sun exposure: avoid exposure to extremely bright sunshine, wear suitable clothing, hats and sunglasses, use sun care products with high sun protection. And don't forget, children less than 3 years old should NEVER be directly exposed to the sun.